Africa's largest canyon, the Fish River Canyon is located in southern Namibia in the eastern Namib Desert. 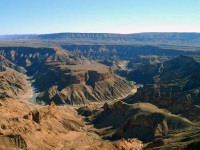 Created by a fracture in the earth's crust, the 100-mile (161km) canyon was carved out further by the erosion of the Fish River over millions of years. Requiring a high level of fitness, good health, and with no facilities whatsoever, hikers must carry all they need. The five-day trail covers 53 miles (86km) and is the best way to take in the canyon's magnificent immensity, passing beneath the sheer cliffs with their visible rock strata patterns towering 1,640-foot (500m) above the harsh, rock-strewn plain. The canyon comes to an end at Ais-Ais, meaning 'burning water' in Nama, where one of the most famous hot spring resorts in the country is located. Hikers can look forward to a relaxing soak in the therapeutic hot water after completing the trail. We are looking for contributors for our Fish River Canyon travel guide. If you are a local, a regular traveller to Fish River Canyon or a travel professional with time to contribute and answer occasional forum questions, please contact us.